DescriptionDid the Mad Butcher of Cleveland also strike in Pennsylvania? 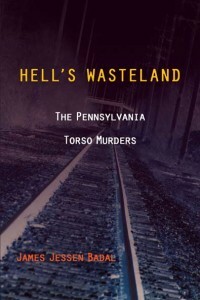 Now Badal concludes his examination of the horrific cycle of murder-dismemberments with Hell’s Wasteland: The Pennsylvania Torso Murders. During the mid-1920s, a vast, swampy area just across the Ohio border near New Castle, Pennsylvania, revealed a series of decapitated and otherwise mutilated bodies. In 1940 railroad workers found the rotting remains of three naked and decapitated bodies in a string of derelict boxcars awaiting destruction in Pennsylvania’s Stowe Township. Were all of these terrible murders the work of Cleveland’s Mad Butcher? Many in Ohio and Pennsylvania law enforcement thought they were, and that assumption led to a massive, well-coordinated two-state investigation. In Hell’s Wasteland, Badal explores that nagging question in depth for the first time. Relying on police reports, unpublished memoirs, and the surviving autopsy protocols—as well as contemporary newspaper coverage— Badal provides a detailed examination of the murder-dismemberments and weighs the evidence that potentially links them to the Cleveland carnage. Hell’s Wasteland is the last piece in the gigantic torso murder puzzle that spanned three decades, covered two states, and involved law enforcement from as many as five different cities. AuthorJames Jessen Badal is an assistant professor of English and Journalism at the Eastern Campus of Cuyahoga Community College in Cleveland. In addition to his volumes on the Mad Butcher, he is the author of Twilight of Innocence: The Disappearance of Beverly Potts (The Kent State University Press, 2005). He has been on the board of trustees of the Cleveland Police Historical Society since 2001 and lectures frequently on the torso murders.